Home » The Whole Damn Thing » The League Cycle » Nightingale » ‘Nightingale’ Available Everywhere! It’s been a crazy couple of days. Amazon’s early posting of Nightingale caught me off guard, so I had to scramble to get posts out there letting everyone know. Apparently it’s paid off, because the book has already cracked the Top 100 and is on its way to the Top 50 in its categories. I’m thrilled that people are buying it and I hope that Alyson, Magnificent, and the rest of their messed up crew find an audience that will stick with them for a while. In addition to Amazon, Nightingale is now available at nearly every place you could possibly buy eBooks. Barnes & Noble and Kobo are lagging behind a bit; but I’ll update this post as soon as I have those links. For those of you wondering where the print editions are; well that’s where audience participation comes into play. Once I get 50 reviews on Amazon, my publisher can start querying physical bookstores to get Nightingale on the shelves. So if you’ve read it and enjoyed it, write a review and we can get it into more people’s hands! Thank you so much, everyone. This has been a dream of mine for a long time and it’s pretty insane that it’s finally come true. 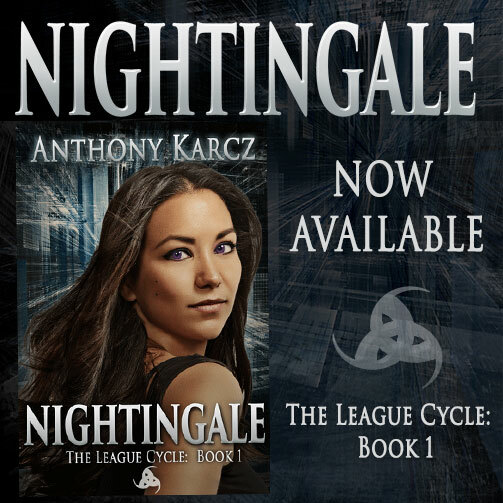 ← ‘Nightingale’ Now Available on Amazon!